4. LED colors: red, green, yellow, blue, white, pink, purple, or even multicolored depending on customers' requirements. 5. Brighter for LED density, and more homogenous for regular arrangement of LED. 1. 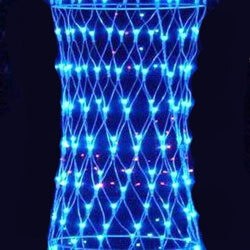 Made by weaving conductive wires together to form meshes, at each intersection point of the net set a LED. 2. Can be extended to increase the width of the net. 3. Flexible, foldable, reusable. 4. Long life span ( over 40,000 hours). 5. Produces waving effect if coupled with light controller.